Proper accounting keeps your business healthy. When you know every detail is being handled by a talented CPA, you can focus on running your business successfully. 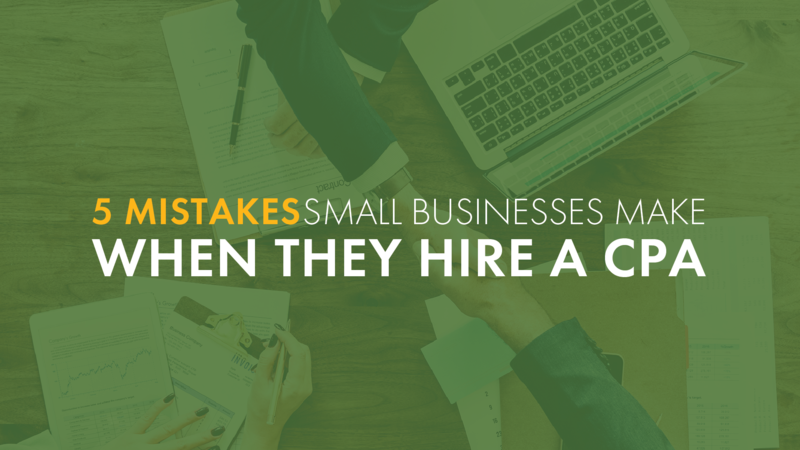 To make sure your accounting is in the right hands, avoid these 5 common mistakes small business owners make when hiring a CPA. When a company needs a CPA urgently, it might be tempting to get the word out fast and start interviewing candidates. But it’s important to pause first and carefully assess your accounting needs. Otherwise, you could end up making a panic hire that doesn’t serve your company well. Start by examining the depth of services you need. Do you simply need someone to handle daily bookkeeping and file your taxes? Or do you need more extensive financial advice about expanding your business or starting a franchise? These are very different needs and should guide the type of person you seek out. Err on the side of requiring more financial skills - especially if you anticipate changes for your business in the next couple of years. Avoid hiring someone simply because they’re a friend, family member, or get a glowing review from someone you know. It can be a bad idea to blend personal friendship with accounting services. You need someone who can be 100% impartial about your financial situation, without any personal influences. Plus, you must be certain the person has solid accounting credentials, aside from their interest in working with your company. After you’re certain a candidate’s financial background is solid, consider whether their individual personality seems to be a good fit for your company. Do you feel comfortable with them? Your CPA is someone who needs to be an excellent communicator, staying organized and sharing information with you in an easy back-and-forth. Look for someone who is open, helpful, and never makes you feel rushed. If someone tells you they’re a CPA, how do you know for sure? Well, you can use a free site like CPA Verify, or as an even better option, work exclusively with a reputable CPA firm that does all the background checking for you. A qualified CPA has a bachelor’s degree in accounting and has passed the CPA exam. Some states require 150 hours of accounting study, which is more than the 120 hours typically found in a bachelor’s degree program. This means in those states, a CPA would need a combined 5-year bachelor's and master's degree program in accounting. Don’t just ask whether someone is a CPA. Make sure of it. A CPA can’t necessarily perform all financial roles for your company. They have to focus on the details of your accounting, and can’t be expected to serve as a de facto financial advisor. You may have needs that go far beyond accounting. In this case, look for a full-service consulting firm that can offer financial advising, strategic planning, and small business coaching. This kind of support can help you navigate your changing business landscape and make successful financial decisions. Ascension CPAs & Consultants offers CPA services, plus full-service consulting and financial support. We can also reduce the tax burden you face and provide business consulting with a personal touch. Call 405-759-2796 or use our contact form for a free consultation.